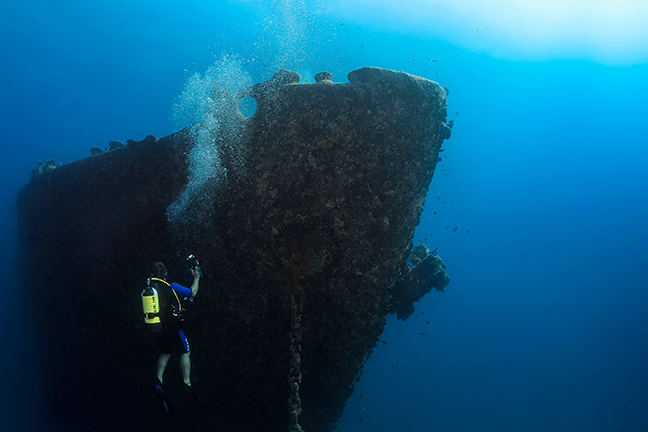 By adding divers to our underwater photos, we are able to bring about a sense of exploration, highlight a focal point and provide a sense of scale to the scene, especially in wide angle reef and shipwreck photography. Viewers will follow your model’s gaze. Photo by Kate Jonker. 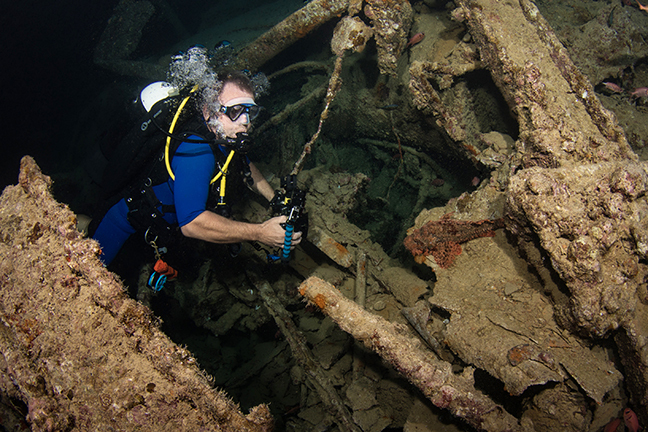 My advice to any diver wanting to take photos – get your buoyancy right before you take your camera underwater. You cannot take photos if you are flapping around trying to stay afloat, or if you are constantly inflating and deflating your BCD. If you focus on getting your buoyancy right before you take your camera into the water with you, your images will be so much better from the start, and the reef and your fellow divers will thank you for it. 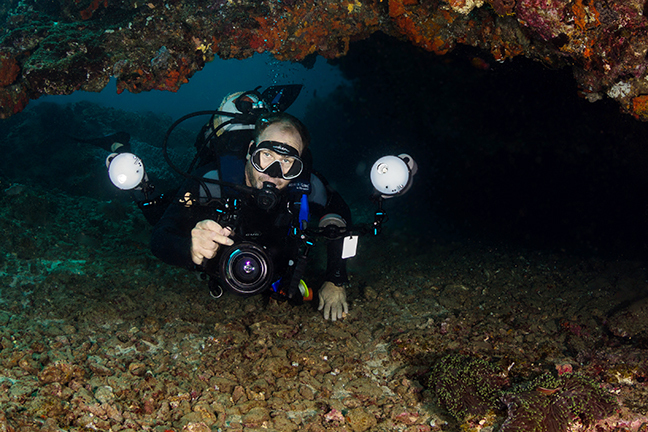 Although it is easy to snap away at other divers underwater, your results will be disappointing and you will probably start annoying people if you are constantly firing your strobes in their faces. To take really great photos of divers, you need to have a patient buddy who is willing to model for you, is comfortable in the water, has good trim and excellent buoyancy skills. A fellow underwater photographer is ideal, as you can take turns modelling for each other. Make sure your model’s equipment is in trim, clipped away and not dangling. 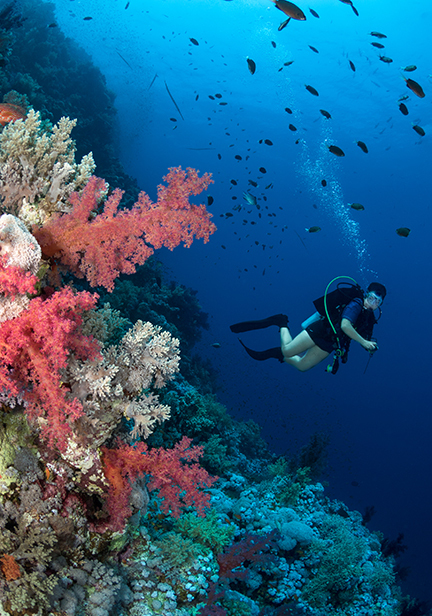 Dangling equipment—whether it is gauges, octo, torch or surface marker buoy—looks untidy and could pose a threat to the reef. Incorrectly positioned equipment, such an octo hose over the model’s shoulder (instead of tucked underneath the arm) looks unprofessional and will certainly raise a few eyebrows. 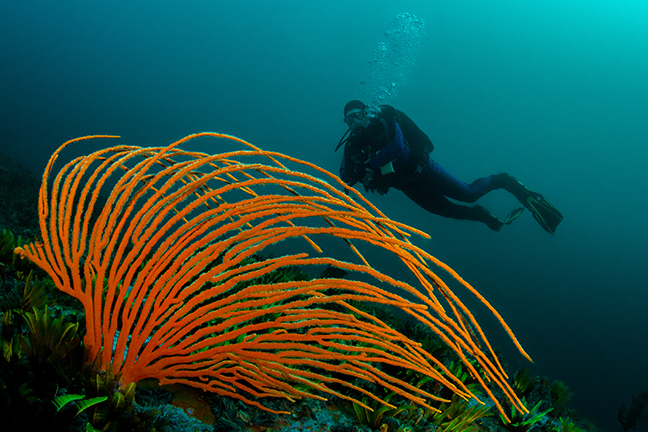 Long, free-flowing hair can be hard to control underwater. The only time it can be successfully managed is if you are taking a photo of your models whilst they are swimming. All they need to do then is quickly tip their heads backwards and swim across the frame, as you take photos of them with their hair flowing beautifully behind them. For photos where your models are not swimming, get them to tie their hair back or put a hoodie or bandanna over it. This looks so much neater. Bandannas can also add a splash of colour to your photos and suit both male and female models. Always remember to use your favourite mask “anti-fog” before getting in the water. Firstly, you need to ensure you can see clearly when taking photos. There is also nothing worse than seeing photos of divers with fogged up masks. It is human nature to want to see the eyes, and a fogged up mask is distracting, looks unprofessional and simply ruins the shot. Similarly, make sure your models do not have too much water lying in the bottom of their masks. I find that for the majority of photos, a clear or transparent skirt is the better choice. This allows more light to enter the mask and highlights the face and the eyes. For more of a “tech” shot, dark-skirted masks work well, but you really have to get your lighting right in order to light up the inside of the mask and the diver’s eyes correctly. Get your model to wear gear with colourful details. 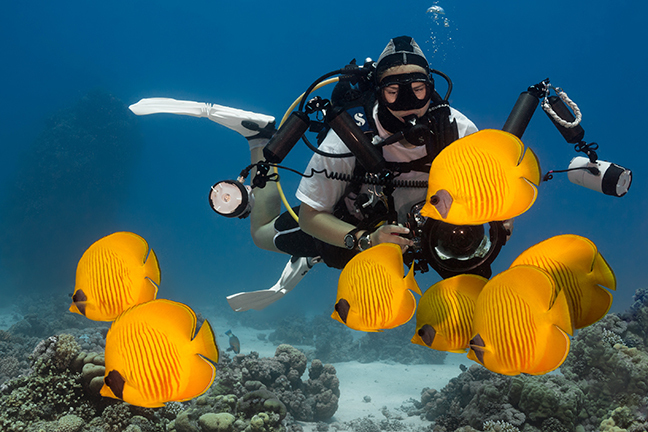 Masks, fins, wetsuits and even BCDs with colourful inserts always help to add a splash of colour to a photo. I personally prefer these “splashes” to all be the same colour or shade. A touch of waterproof mascara and eyeliner can also help to make the eyes pop, but it is not necessary to go overboard—try to keep make-up natural (for male divers, make-up is not compulsory). A nice strong torch can be used in so many ways, especially when you are photographing a diver in a cave or wreck, or where you have a dark background and the diver is in silhouette. 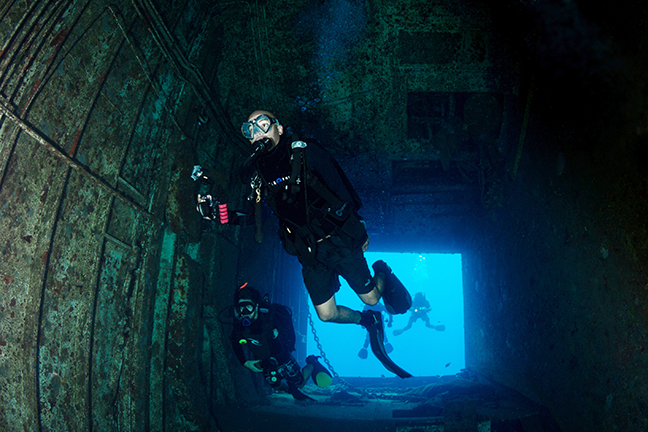 Have your diver use a torch to highlight certain areas, as the viewer’s eyes will naturally follow the beam of light. When models are closer to you, they can even use their torches to give a snooted effect to the image. 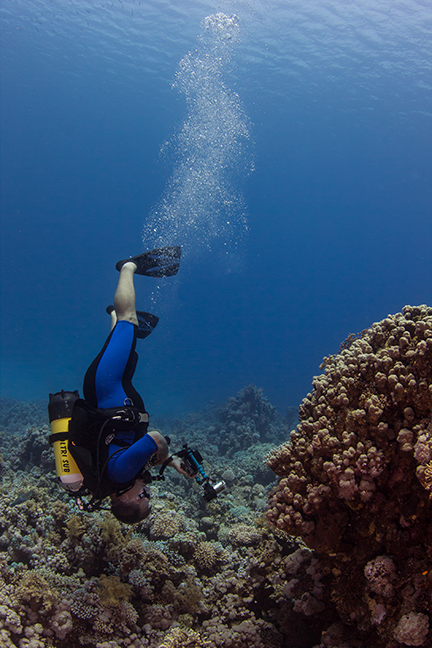 Start your dive with your preferred camera settings for wide-angle shots and adjust your camera speed to lighten or darken the water column in the background. Use your strobes to add light to your foreground and your model. Make sure the model is as close to the centre of the image as possible, especially if you are using a fish-eye lense, or the model will become distorted if too close to the edge of the frame. If your models are further away, you will not be able to light them up, and they will have a blue cast to their skin and hair. 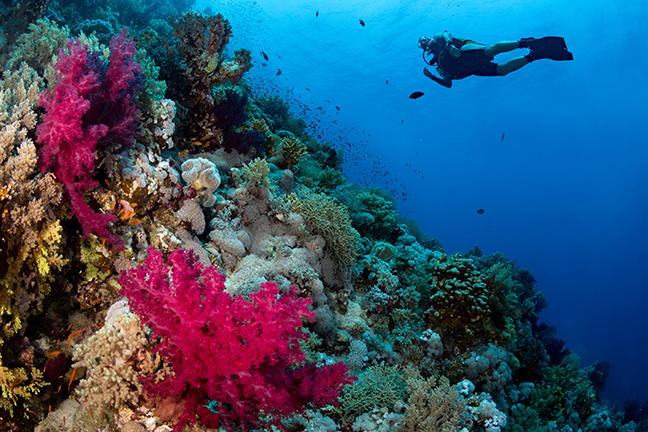 In this case, concentrate on lighting up the foreground and have the diver as a silhouette against the background. Have the reef, gorgonian or marine creature as the star of the show; light them up and have the diver’s silhouette in one of the quarters of the frame. To benefit the most from your limited time underwater, it helps if you both know the dive site and the kind of marine animals you expect to see. Discuss the shots you want to take in advance. I find it useful to have similar images on my iPad or smartphone, which I can show my models beforehand, so that they have an idea of what I am trying to achieve. For close shots where your model is looking at a fish, critter, sea fan or artefact, have the model face your direction with her or his mask, but have the model’s eyes looking at the point of interest (the angle should not be too great). This will enable you to light up the model’s eyes with your strobes and create a point of interest, as the viewer will follow the model’s gaze. For closer shots, get the model to look over your shoulder instead. Divers looking straight into the camera always tend to look cross-eyed and a little crazed. Never allow your models to sit, stand, touch or hold onto any marine life, reefs or wrecks. Not only can they damage the reef or marine life, they could also injure themselves on stinging or sharp objects. For wider angle shots, models should ideally swim across the frame, parallel to your camera, preferably with their knees together and one of their legs bent in kicking motion. This is the most natural way to photograph a diver and gives you the opportunity to get really great action shots. When I am acting as model, I find it really useful to look at my reflection in my buddy’s dome port to check whether my positioning is correct. Exhaled bubbles in your model’s face will ruin a shot. As divers should never hold their breath underwater, tell your models to breathe normally and take your shot once they have exhaled and the bubbles are clear of their faces and slightly above their heads. I also prefer to leave the bubbles in the image, keeping it natural rather than removing them in post processing. 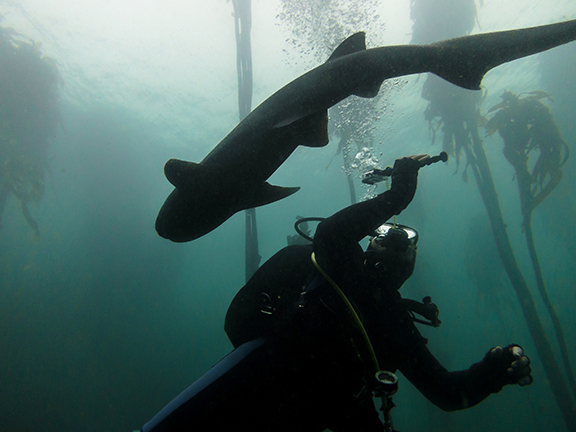 Kate Jonker is an underwater photographer and writer based in South Africa. 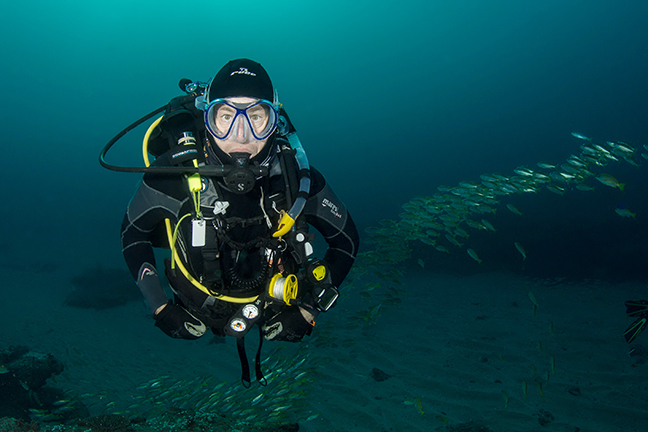 She teaches underwater photography courses and is a dive guide, photographer and skipper for her husband’s scuba diving centre, Indigo Scuba in Gordon’s Bay, Cape Town. For more information, please visit: Katejonker.com.